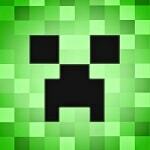 Try to get out of the maze of Mazecraft. The player is surrounded on all sides by dangerous monsters – creepers that explode when approaching. At your disposal only the bow and a limited number of arrows, which you need to use wisely.